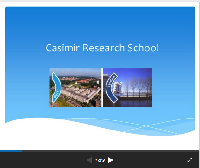 Casimir Research School - Leiden University's and Delft University of Technology’s joint research school in interdisciplinary physics - brings together over 260 PhD students, 115 postdocs and 100 faculty members. The school's research program is developed by groups at the Kavli Institute of Nanoscience in Delft and at the Leiden Institute of Physics (LION). Casimir, established in 2004, is named after Professor Hendrik B.G. Casimir (1909-2000), whose involvement in fundamental as well as applied physics left many traces in the Dutch scientific landscape. "Strong existing collaborations between my lab in New Zealand and The Brouns lab led me to explore PhD positions provided by Casimir."